With deep insight into the philosophies of Lincoln, as well as vivid portrayals of his personality traits, the movie concentrates Lincoln’s determination to pass the 13th Amendment, which abolished slavery. In January of 1865, with the Civil War drawing to a close and victory in the Union’s sight, President Lincoln, a Republican, began an aggressive campaign to have the bill passed while a lame duck Congress was in session, and during a period when the Confederate states had seceded from the Union and were consequently unrepresented in the Congress of the United States of America. The President needed some Democrats to cross the aisle. Although his Emancipation Proclamation had been issued two years prior to this effort to pass the 13th Amendment, Lincoln feared slaves who had been freed by the Proclamation would be re-enslaved. Therefore, the president left no stone unturned in his pursuit of passage of this monumental legislation. As most are aware, the bill passed, albeit by a slim margin over the two-thirds majority needed, and slavery was abolished. At least as far as the Constitution was concerned. Although the Declaration of Independence states “all men are created equal,” such was not the case following the colonists triumph against England in 1783, nor did the 13th Amendment guarantee rights to those who were freed from the legalized yoke of slavery. While water fountain, restrooms and lunch counters were the first lines of battle for those fighting for their civil rights, real estate restrictions and covenants for the various neighborhoods across the nation, even today, are laced with discriminatory language. It would be impossible to rid all documentation of this language and it is unenforceable, yet it remains in place. The sale of the week is a reminder of those times. Those times, by the way, are not in the 1700s or the 1800s, but 1948 in restrictions filed in the Davidson County courthouse and can be seen in the sale of the week. This week’s featured sale will not actually close until next week, so I guess it’s the sale of next week. But the title work for this transaction revealed a startling document, and it was forwarded to me by Paul Soper of West End Title, the company closing the sale for the seller. In short, not only were African-Americans forbidden to buy the property, they were not allowed to rent the house. And this restriction remains on record. 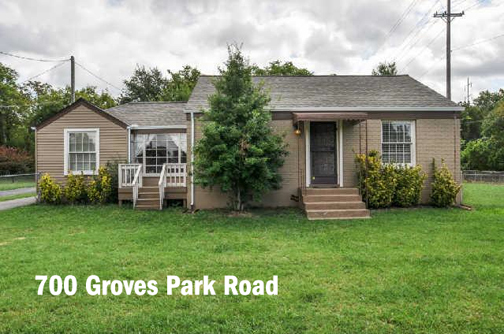 The residence at 700 Groves Park is situated on a serene lot in a progressive area, East Nashville, well known for its embracing, welcoming attitude. This brick home was built in 1950, a time when the restrictions were in place, but updated with modern plumbing, electrical, and overall view of the world. The residence features concrete countertops in the kitchen and new bathrooms, and the garage has been converted to a large master bedroom. The original lot was 81 feet by 135 feet, .43 acres, and the premises include a carport and a detached storage area, both somewhat unique to the neighborhood. The current owner paid $149,900 in 2008. The list price was $159,950 this time around, and it sold in short order. The roof was replaced in August, along with most of the roofs in the city. So the new owner should never have to worry about having a roof over her head. Richard Courtney is a partner with Christianson, Courtney, Patterson, and Associates and can be reached at richard@richardcourtney.com. There was a trivia question last week: Who is the major league baseball player to achieve the most victories and never win the Cy Young Award? Answer: Cy Young.